New Zealand Art Print News - brought to you by New Zealand Fine Prints . News from New Zealand artists, painters and print-makers with articles about all the latest prints. We interview NZ artists and write about fine art printmaking as well as reproduction prints such as giclee and prints on canvas. Also industry gossip, gift buying trends and general NZ art business news. One of the interesting aspects of working at a business with a high profile online is the "unpaid helpdesk" kind of enquiries that flow in via email, over the phone and increasingly through Facebook messenger as well. These are the enquiries that come to us when a NZ artwork is discovered, about to be sold, or just researched over the internet to find out a bit more about the print or artist. We deflect enquiries about values of paintings to the right auctioneer for the quality of work/artist and can usually help if a person is trying to work out if an artwork is a painting or a print (what they paid for it is a good place to start!). Most of these enquiries will not lead to a sale but there doesn't seem too much harm in helping out, hopefully the next time they are thinking about prints they will think of New Zealand Fine Prints. We got a different kind of enquiry over the weekend from the States. There a couple of kiwis had discovered a Lindauer maori portrait print in an antique store and they were keen to know if it had originally been sold by us. What was cool about their enquiry however was that they also emailed a photograph of the label on the reverse of the framed print which had a very well researched blurb about the original painting, the artist and the subject (Rewi Manga Maniopoto) which contained much that was new to us despite having stocked this print for many years. Fascinating to learn that the cloak he is wearing is decorated with the tail hair of specially reared dogs that slept on clean mats to "keep their tails as white as possible"! 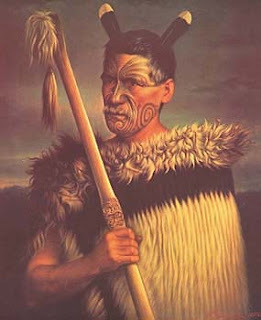 Rewi Manga Maniapoto, born between l815 and 1820, was descended from Hioturoa, navigator of the ancestral canoe Tainui, and was an ariki of the Ngati Maniapoto. His tribal lands lay to the south of the Waikato tribe, in the rugged territory of the Waipa and Puniu rivers. From his boyhood, Rewi Manga was fully engaged with the Ngati Maniapoto in inter-tribal warfare. Rewi Manga is remembered as one of the most popular fighting chiefs of the Maori King Movement. It was he, for instance, who encouraged the participation of Ngati Maniapoto and Waikato people in the Taranaki controversy, ignoring the opposition of the Maori King and Wiremu Tamehana. Rewi and his Ngati Maniapoto people also acted unilaterally in their bid to clear European authority out of the Waikato when they took possession of the Court, the schoolroom and the printing press of John Gorst, the Civil Commissioner of the district, at Te Awamutu. No human situation can be conceived more desperate or more hopeless their lands gone, their race melting away like snow before the sun, and now their own turn come at fast; with enemies surrounding them on all sides . . . this is the last peace and surrender: hoa, ka whawhai tonu ahau ki a koe, ake' (Friend, I shall fight against you for ever and ever). In the years following the end of the Waikato war, the Ngati Maniapoto, led by Rewi Manga, together with the Maori King, Tawhiao Matutaera Potatau Te Wherowhero, encouraged Te Kooti to take up the work of routing the European settlers from the land. However, Rewi Manga did eventually renounce his support of Te Kooti in return for the assurances of the government that there would be no further military' operations in the King's territory. Rewi Manga lived until 1894, through the period which saw the enactment of confiscation and the further decimation of the Maori population. Lindauer's portrait depicts Rewi Manga in his prime, proudly displaying symbols of his chiefly power, and with full facial moko and huia feathers. He holds a hoeroa, a rare weapon carved from the- lower jaw bone of the sperm whale. His dogskin cloak, a kahu waero, was the most highly prized type of the Classical period. It is a dress mat like a korowai, but so thickly covered with strips of white dogstail that the kaupapa of the cloak is completely concealed by the long-haired bushy tails. This type of cloak was made by fastening strips of tail at one border of the mat, hanging loosely to form a heavy fringe. On the body of the mat, strips were placed along the warp and secured by the weft threads. White haired dogs were greatly prized, and were taken the greatest possible care of: They slept in a house on clean mats, so that their precious tails should he kept as white as possible. Their tails were curiously and regularly shaved, and the hair preserved for ornamental use. Hi, I have three Lindauer prints, Patuone 262/500, Wiremu Kingi 262/500 and Pera Tutuko 262/500 - all are Reproduced courtesy Auckland Art Gallery. They are currently unframed, and in average condition - no tears but have slight creases. Is it worthwhile getting them framed?